What is SDLC Waterfall Model? Waterfall model is an example of a Sequential model. In this model, the software development activity is divided into different phases and each phase consists of series of tasks and has different objectives. In waterfall, development of one phase starts only when the previous phase is complete. Because of this nature, each phase of waterfall model is quite precise well defined. 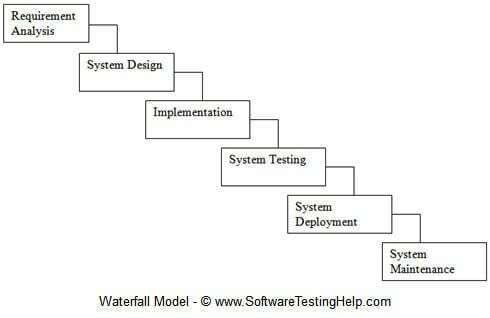 Since the phases fall from higher level to lower level, like a waterfall, It’s named as waterfall model. 1 Requirement Analysis 1. Capture all the requirements. 2. Do brainstorming and walkthrough to understand the requirements. 3. Do the requirements feasibility test to ensure that the requirements are testable or not. 2. Capture the hardware / software requirements. 2. Integrate the codes for the next phase. 4 System Testing 1. Integrate the unit tested code and test it to make sure if it works as expected. 2. Perform all the testing activities (Functional and non functional) to make sure that the system meets the requirements. 3. In case of any anomaly, report it. 5. Report your testing activities. 2. Make sure that there are no sev 1 defects open. 3. Make sure that the test exit criteria are met. 4. Deploy the application in the respective environment. 5. Perform a sanity check in the environment after the application is deployed to ensure the application does not break. 6 System maintenance 1. Make sure that the application is up and running in the respective environment. 2. Incase user encounters and defect, make sure to note and fix the issues faced. 3. Incase any issue is fixed; the updated code is deployed in the environment. List of new features implemented. When to use SDLC Waterfall Model? Requirements are stable and not changed frequently. There is no requirement which is not understood or not very clear. Resources are well trained and are available. Simple and easy to understand and use. For smaller projects, waterfall model works well and yield the appropriate results. Since the phases are rigid and precise, one phase is done one at a time, it is easy to maintain. The entry and exit criteria are well defined, so it easy and systematic to proceed with quality. It becomes very difficult to move back to the phase. For example, if the application has now moved to the testing stage and there is a change in requirement, It becomes difficult to go back and change it. Delivery of the final product is late as there is no prototype which is demonstrated intermediately. For bigger and complex projects, this model is not good as a risk factor is higher. Not suitable for the projects where requirements are changed frequently. Does not work for long and ongoing projects. Since the testing is done at a later stage, it does not allow identifying the challenges and risks in the earlier phase so the risk mitigation strategy is difficult to prepare. In the waterfall model, it is very important to take the sign off of the deliverables of each phase. As of today most of the projects are moving with Agile and Prototype models, Waterfall model still holds good for smaller projects. If requirements are straightforward and testable, Waterfall model will yield the best results.